Sunnyvale, Calif. – August 9, 2010 – Vitria Technology, Inc., today announced that TXU Energy, a market-leading Texas retail energy provider (REP), has selected Vitria’s M3O Operational Intelligence (OI) platform to enhance customer service. With more than 2 million electricity customers in Texas, delivering an exceptional customer experience is crucial to TXU Energy’s ability to compete in the retail power market. Vitria M3O provides TXU Energy with real-time, dynamic intelligence on the state of critical processes (i.e., enrollments, transfers) so it can proactively identify and remediate situations that could adversely impact the customer. TXU Energy initially is utilizing Vitria M3O to monitor and manage the end-to-end enrollment process, assessing in real time its performance in areas such as new service initiation, change of service requests, and contract terminations. TXU Energy anticipates Vitria’s Operational Intelligence solution will enable it to reduce errors and eliminate costs from this process. Sendero Business Services, a Dallas-based management and technology services consulting company and a winner of the U.S. Chamber 2010 Blue Ribbon Small Business Awards, partnered with Vitria to deliver a tailored M3O solution designed to improve the customer care process and provide substantial cost savings within weeks of full deployment. M3O provides a complete, integrated platform for OI applications enabling decision-makers to respond rapidly to changing business conditions in real time, and increase operational efficiencies and overall responsiveness. 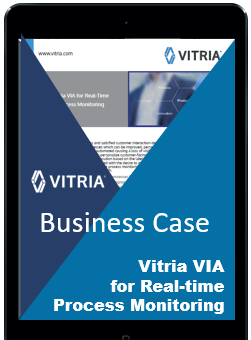 Vitria Technology, Inc. provides the industry’s leading Operational Intelligence platform, empowering partners and customers to develop innovative Operational Intelligence solutions to analyze business activities in-process and take real-time action. The result is better decisions when they matter most—before opportunities have faded or problems have escalated. With a rich heritage as a technology pioneer, Vitria’s award-winning process integration solutions provide the backbone for many Global 2000 companies’ mission-critical business processes. Vitria has customers in North America, South America, Europe, Asia, and Australia.